In most cases, when your vehicle battery dies and you charge it back or replace it, the car radio will ask for a code that you need to input such that your radio can get to functioning once again. You will also lose the channel settings and dashboard memory. Today I'm going to show you how to disconnect and change your car battery safely and without losing the radio and dashboard settings. Set of spanners to open bolts. Set of jump packs or jump leads/ booster and a 12 volts battery. Your vehicle battery will be connected by brackets, which you need to remove on replacing the battery. - Once you open your bonnet, you will find your battery in one corner, probably covered in a box or just a paper. - Using the spanner, you can start by removing the bracket that holds the car battery so that you can have enough space to use the automotive memory saver. - Just to be safe, begin by checking the voltage of the memory minder with a multimeter. Make sure that we have a potential of 9 volts DC. - Carefully clip the car memory keeper clips to both the positive and negative terminal of the car battery. - Slowly remove the battery hooks by unscrewing with the spanner and then get the battery out. - You can then lower the new battery into its place and connect the leads while ensuring to connect to the proper leads, where the red goes to the positive and black to the negative. - Fix in the new battery with the memory minders hooked to the battery leads. This will enable restoring back of the memory. - Fix the battery bracket/holder back on as well with the help of a spanner. - You can then switch the vehicle on, to test whether the battery has been fitted well and if the radio is working well. 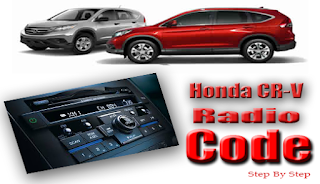 - If you followed the procedure properly, the honda radio should switch on and display the same settings as before you changed the battery. The crocodile clips from the ends should never touch each other at any cost. It is very important to ensure that you have all the tools and you are able to follow all the steps or instructions provided. In most cases, things may tend to go wrong and hence you end up losing the settings when you do not use the procedure, forcing you to head to the garage. However, with this video and the details, you don't have to get back to the dealership to try and get those codes back to reset your vehicle. This would be very time consuming and can cause you a lot of trouble. If you have any question or require further assistance, please feel free to comment below, thanks.